I am at retreat this weekend with my Aunt Arley and Mom. 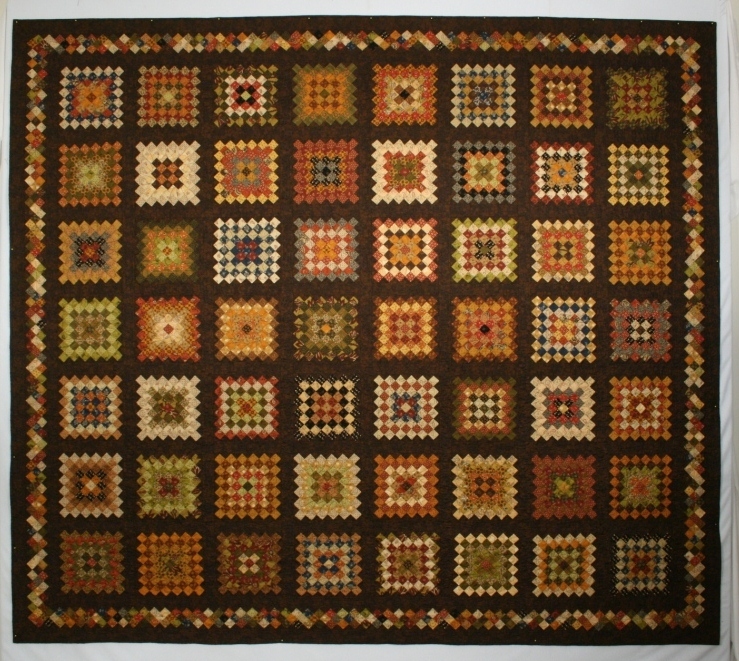 I have this brown quilt to share with you. 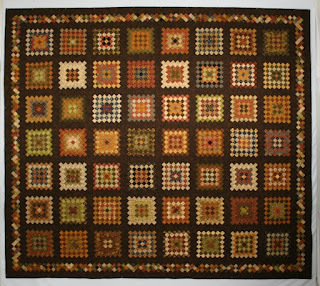 My mom, Betty and my aunt, Myrna made this quilt top and I did the machine quilting. 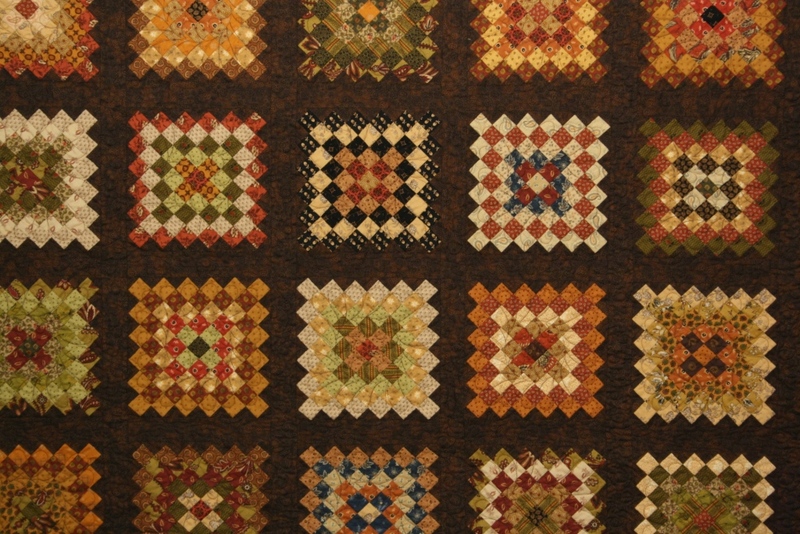 It is a granny square quilt. It is big something like 86" square. As this month Scrap Saturday is Brown, I thought it was a good time to show you this beauty. The quilt has been donated to be raffled off this year. The Little Red Deer School (now a community hall ) needs a new roof. Our hope is the ladies of the local WI sell enough tickets that it covers the cost of the new roof. They are selling 400 tickets for $20 each. Just so you know I can not mail out tickets outside of Alberta. 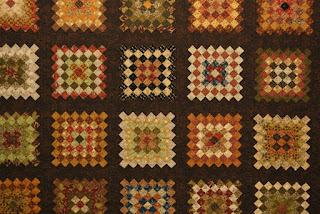 The three of us ladies made the quilt as a thank you for the years my Dad and his brothers went to the one room school. My dad rode a horse to the school, up hill both ways you know. His banana and peanut butter sandwiches were frozen still at lunch time. Most of the fabrics are civil war reproduction fabrics. 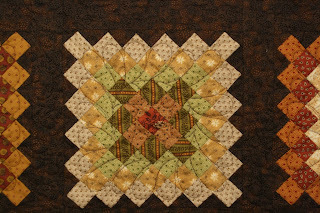 I quilted it with feathers on all the squares. You can go see what the other ladies are doing for Brown this month by checking out Soscrappy. Very nice! A lovely assortment of browns. 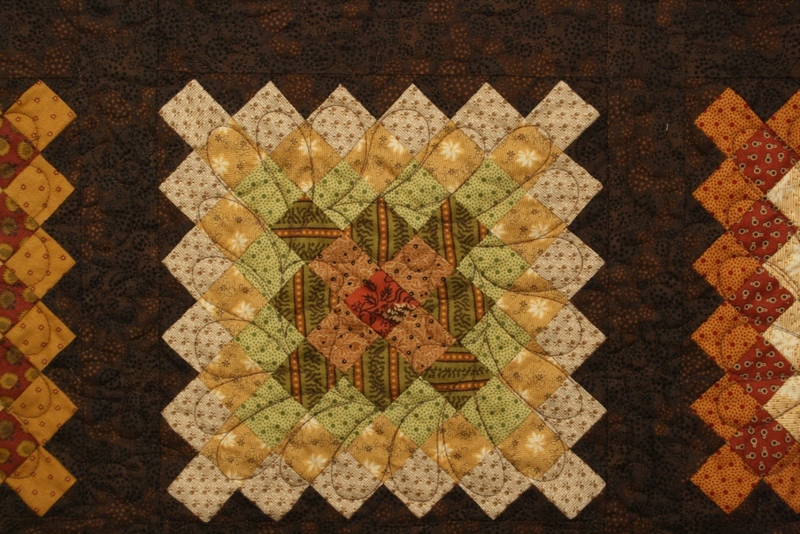 Is the outer border pieced as well? Hope it raises plenty of funds for the school/hall! I Love your granny square quilt. Too funny about up hill both ways... I always heard that from my Dad. Is your Aunt's name Arlene by any chance? That is my Mom's name and I rarely hear it although she was named after my grandmothers best friend who lived in Canada. Hope you are having fun at retreat. It's a beautiful quilt! I love this pattern, and hope to try it sometime. Funny how we both had family who attended one room school houses- my mom did too. I just finished a post about the celebration they had for my mother's one room school house. Hope all is well- work is starting to get very busy- it soon will be report card time.